Sleek low profile dash replaces the bulky stock dash on stock 1996-2007 FLHX / FLHT / FLHTC / FLHTCU / FLTR . Material is polished cast aluminum. Kit includes metal dash, rubber seal for between dash and tank smooths out the top of the tank for a true custom look. Sleek low profile dash replaces the bulky stock dash on stock 1996-2006 Road Kings. Material is polished cast aluminum. If your stock Bezel and Indicator do not fit in our dash, the you will need to purchase the Bezel and Indicator from Harley-Davidson. The part number for the Bezel is 68112-99, and the part number for the Indicator is 68113-99A. All parts must be prefitted before painting. 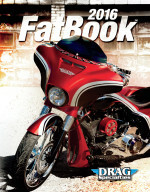 Cover that ugly factory ignition switch with our cross cover Fits touring models from 2007 to 20013 (except Road King). Installs in seconds. A slick, original design Matte Black steel construction. Chrome two-part pop-up gas cap. Works great with our fiberglass dashes.